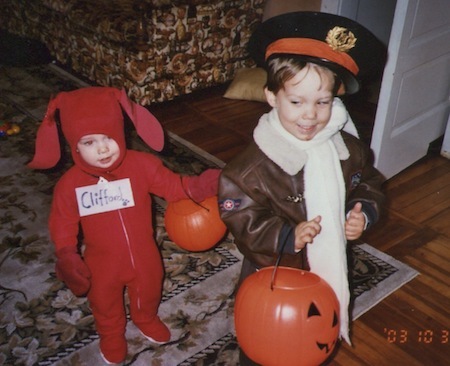 2003 – Ambrose (age 1) as Clifford and Morrigan (3) as an “airplane driver” as he used to call pilots (ha!). 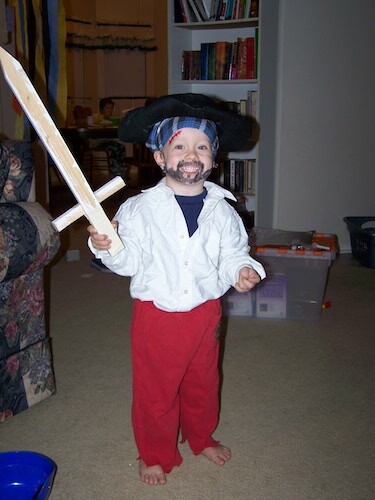 2007 – Laurence (3) as a pirate. He was terrified the whole night that the makeup we painted on him was going to drip into his mouth if he moved, so he had on this pained grin the entire night. Ha!! 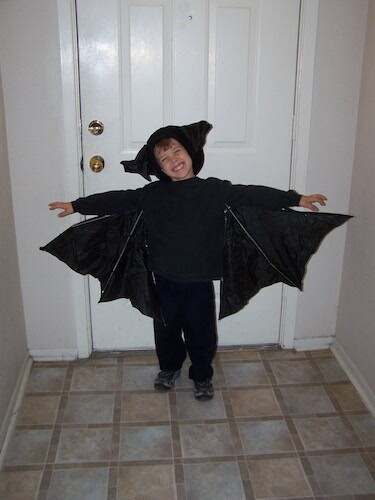 2008 – Ambrose (6) as a bat. Jason made those wings out of an old umbrella! 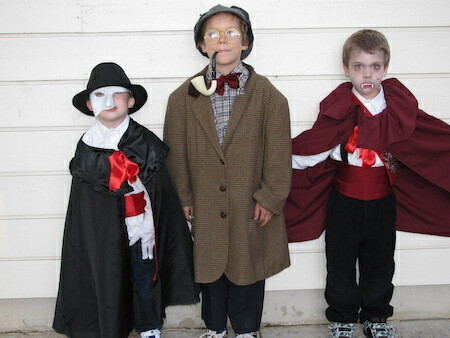 2009 – Laurence (5), Morrigan (9), Ambrose (7) as the Phantom, Sherlock Holmes, and Dracula. We’d entered that part of elementary school where the kids could wear costumes to school if they were literary characters. They mostly picked these at random, except Laurence, who was obsessed with the Phantom of the Opera musical soundtrack at that time. 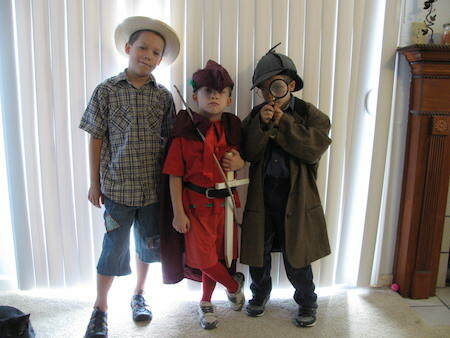 2010 – Morrigan (10), Laurence (6), Ambrose (8) as Huck Finn, Will Scarlett (from Robin Hood), and Sherlock Holmes. Do you like how Ambrose pretty much stole Morrigan’s costume from the year before? Once again, they were piecemeal except Laurence, who was obsessed with Robin Hood that year. 2012 – Laurence (8) as Sir Galahad from the King Arthur stories. Once again, this was his current obsession. 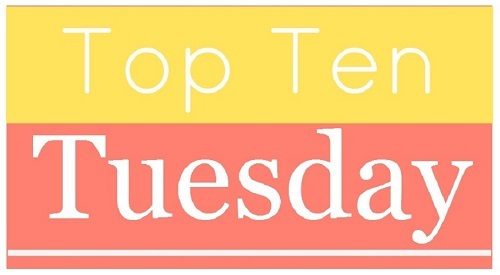 At the time, he had hair down to his shoulders, and at one house, they asked who he was, and he said “a knight” because it was easier, and they kept saying, “She knows what she wants to be!” He was really irritated. Heh. 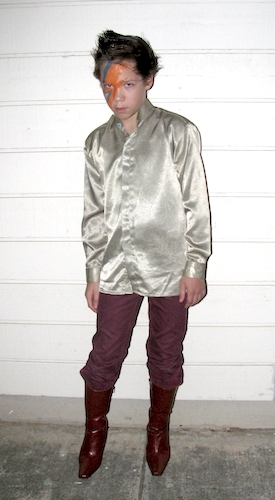 2013 – Morrigan (13) as Ziggy Stardust. He stayed home to pass out candy that night. This was the last year that Morrigan ever dressed up for Halloween – though he says he might this year, if he can gather pieces to a costume he hasn’t revealed yet! 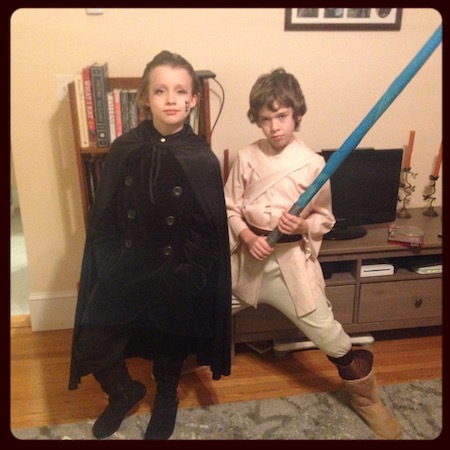 2014 – Laurence (10) as an assassin (a costume he designed himself, down to the mark on his cheek and the poisoner’s bottle he wore on his belt), and Ambrose (12) as Luke Skywalker. Favorite story about this year. Halloween morning as I made coffee, Laurence came up to me wearing his costume. I pointed to my Slytherin coffee mug and said, “Slytherin mug.” He looked at me for a second, pointed to his hair (slicked back like Draco Malfoy), and said, “Slytherin hair.” Ha! 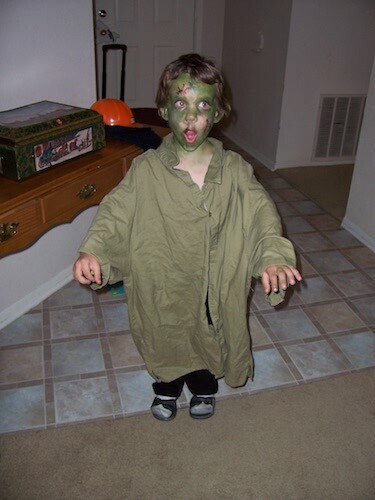 This was the last year Laurence dressed up for Halloween. 2016 – Ambrose (14) is my only child who continues to dress up to this day. 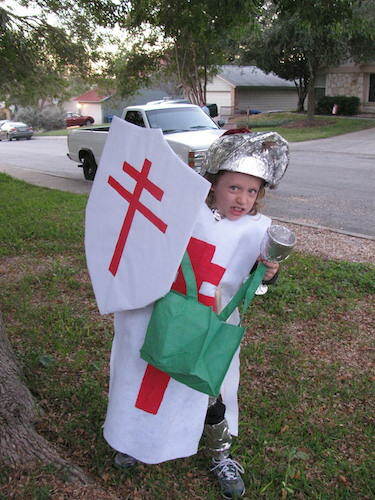 Now that he’s in his mid-teens, he has to design his own costume every year. 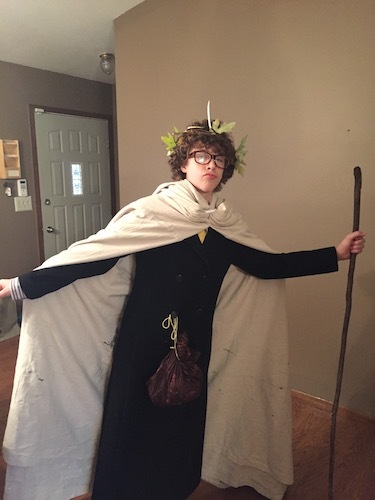 For that year, he dressed himself up as a druid, complete with an actual leaf wreath and a long stick. He went out trick or treating with his cousin Xarissa (who was almost 10). 2014 – One day, the family was at Target, and Laurence (10) was walking through the aisles as we shopped for potential Halloween costume stuff. 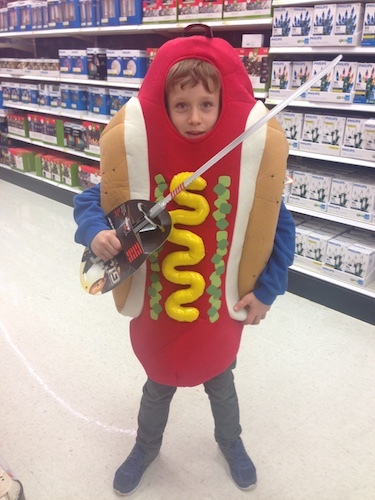 We found him a few rows over, dressed in a hot dog suit, with a sword in his hand. Yes, he IS a fighting hot dog. His face – “What? What’s weird here?” – is priceless. He didn’t get the costume, however. 2013 – I very rarely dress up for Halloween, regardless of whether I take the boys out door to door, or stay at home to pass out candy. 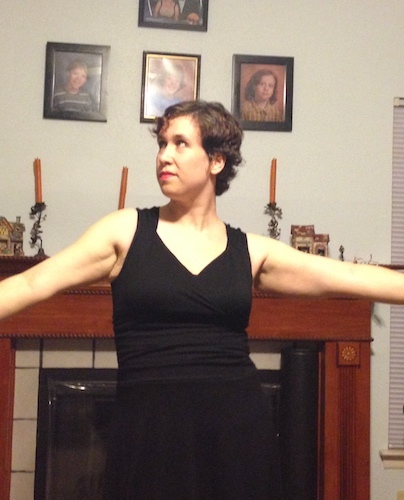 However, in 2013 I found a perfect flapper dress and hat, and I just had to dress up. I put on makeup and curled my hair across my cheek. It was an awesome costume, and I particularly liked it at the end of the night, with hat off and just dancing around the living room. This is one of the only photos I have of me in costume since I was a kid, and definitely my favorite costume of my time in the Gignacery. I tried to get my three boys (who are now 18, 16, and 14) to dress up as the Sanderson sisters for Halloween this year. They declined. It would have been an awesome group costume. But to be fair, Ambrose’s planned Santa Claus costume (to mess with everyone’s heads, he says) is also pretty awesome. How fun! I love that bat wings made out of an umbrella, and you gotta love Sherlock Holmes. That’s awesome Ambrose is being Santa this year! That umbrella costume was so awesome! You can make a lot of DIY stuff if you’re really determined haha! I love that Ambrose still dresses up. Both my kids put that aside many years ago. I love it too. He doesn’t want to let go of that childhood feeling and I’m glad for him to keep it as long as he can! Aww, they’re so cute! I love the armed hotdog.